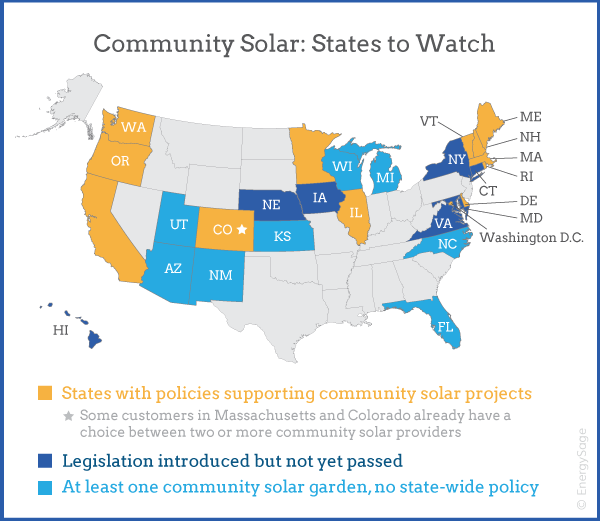 So far, only a small number of the states with policies that support community solar gardens have markets that could be described as competitive. Consumer choice is still limited, with most consumers having at most one community solar garden offering available to them, if any. But community solar markets are poised for expansion in about a dozen key states. Massachusetts, Colorado and Vermont are among those where options are growing. If you are a National Grid customer in Massachusetts, for example, it's already possible to get community solar quotes from several companies. This article will help you evaluate and compare community solar garden offers, providing advice on what to look for and keep in mind. If you're considering community solar, you probably hope save money on your power bill, as you would if you were looking into rooftop solar. While all offerings present essentially the same environmental benefits, some community solar projects promise bigger savings than others. And even if you only have one option, you should clearly understand its value proposition before signing anything. And don’t forget to compare it to the option of installing solar panels at your property. Below are some factors to consider and questions to ask yourself and a community solar garden salesperson when reviewing community solar project offer. What is the minimum performance guarantee? Participation in a community solar farm should offer you certainty about your electricity prices. This should also mean certainty about how much solar power your share of the array will produce. Does the agreement guarantee a minimum level of solar production per year, and over the life of the system/subscription contract? If the system generates less power than expected from year 1, for example, will you have to wait until year 20 before being reimbursed? 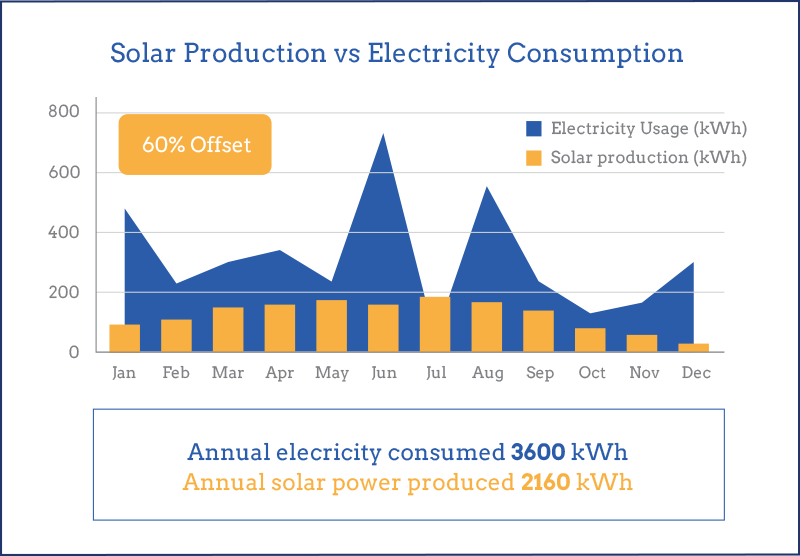 With community solar, you will be signing up for a 'share' (in kilowatts, kW) of the community solar project's capacity. 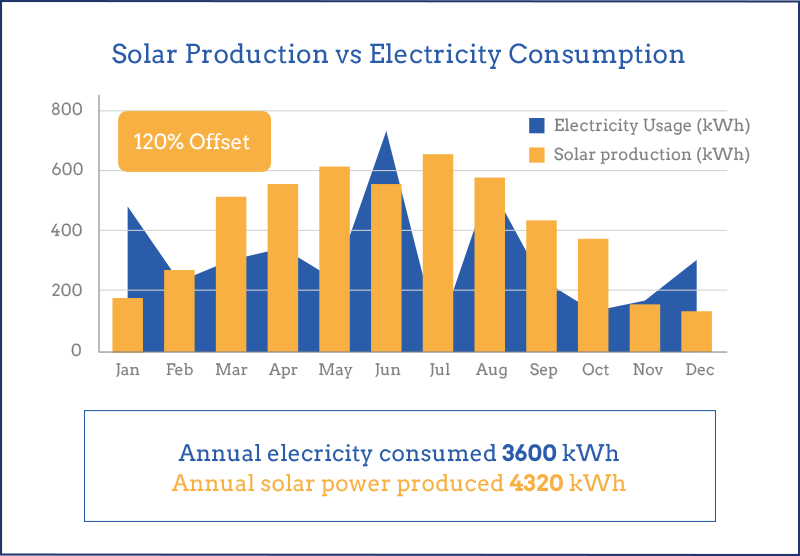 Your share's solar output will usually be higher in summer, lower in winter and will also vary month-to-month. This means that in some months your overall electricity costs may be more than they would have been without solar, while in others they will be lower. At the end of the year, you’ll want the two to balance out (you can carry solar credits over from one month to the next). Most community solar providers will recommend that you size your system to meet approximately 100% of your current annual electricity needs. In some cases, however, you may be able to ask to have a smaller or slightly larger share, depending on your circumstances. For instance, if you anticipate that your electricity usage might actually fall in the future, aim to undersize your share in the project (usually easier to do this before signing up than after). You don't want to be stuck paying for solar power you don't need - especially if you're in a subscription-based program (see below). Similarly, if you expect your electricity usage to increase in the future, you may want to buy a larger share. However, if you do so – and don’t end up using the extra electricity – you may not be able to recover those extra costs. Is it an ownership-based program or subscription-based program? Will you pay for the system up-front with cash or take out a loan to purchase your share of the community solar garden (either a number of panels or a number of watts), or make ongoing payments for the electricity it generates under a 'subscription' model? Purchasing a share in a community solar project is like making an investment in a rooftop solar system: You are making a payment now in order to save money on power bills in the future. What's the gross cost per watt? - Knowing the $/W price for a share will allow you to meaningfully compare pricing offers. Are you eligible for any tax incentives or rebates? - This will depend on what's on offer through your state and utility, as well as the pricing structure of the project itself. This will allow you to then calculate the net cost per watt of your share in the project – the total amount you will pay in the end. Are there any additional fees? - Maintenance and administration costs are usually included in the purchase price, but it's important to be sure. Can you get a loan? - Solar loans could be a good option if you don't have the spare capital to sink into a community solar share. In the best-case scenario, you could pay zero down while saving money from the beginning and eventually owning your share of the solar garden. What's the estimated payback period? - How long will it take before you recoup your initial investment? All of the above factors will play a role in determining this. A good quote will give a transparent, conservative estimation of payback time. Can you take the panels with you at the end of the term? - Ownership-based programs will generally let you take your share of panels home after the project is decommissioned (but not before!). At that point you may use them as you wish, but keep in mind that the panels are just one small part of what you paid for initially, which also includes inverters, cables and mounting equipment. Think of this as a small 'bonus' to having participated in the project. We recommend you compare the cost & savings of installing solar panels on your property before making a decision to buy a share of a solar garden. Subscription-based programs come in a variety of forms, but they can all be compared by looking at how large a savings they offer over a set period of time. Some programs offer more certainty about future savings than others. Penalty fees for early termination of a contract will also vary. When will you start saving money? 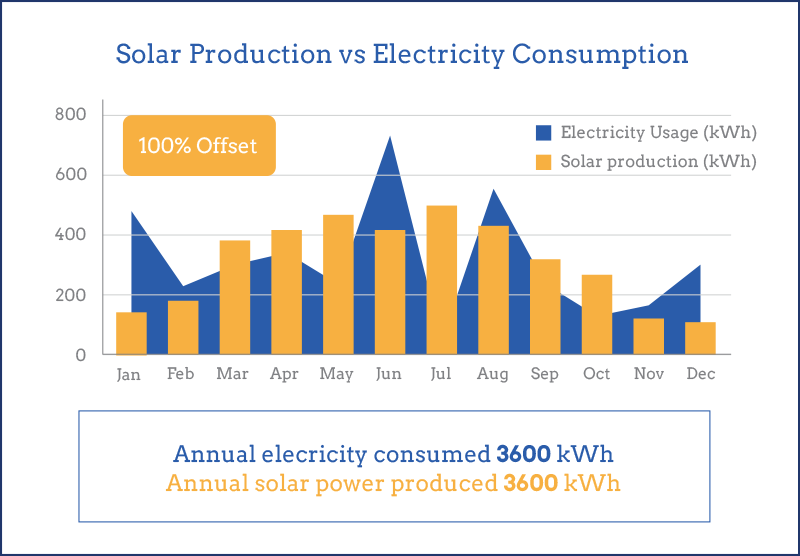 - Some programs may start you at a ¢/kWh solar rate that is higher than your utility rate, promising that inflation (around 4.5%/year) will eventually drive utility rates to be higher. Some will also set the solar rate to rise (albeit at a lower annual percentage, e.g. 2.5%). Other programs will set a fixed, flat rate for solar, and still others will tie your electricity rate to a percentage below your utility rate. If you have a choice, fixed flat rates and utility discount rates offer the most certainty what you will pay for solar in the future. Is there an upfront fee to join the program? - If so, how much is it, and how far into the future will it push the point at which you start saving? Will you be charged late payments? – Receiving electricity from a community solar garden is not always the same as with public utilities, and as such you may not have the same protections if you happen to run behind on your bills. Check the terms of your contract. Are there any penalty fees for early exit from the program? - How much of the remaining contract will you be required to pay for if you need to move and you can't find someone to take over your subscription? What is the 'break even' point for signing up in the case that you have to exit the program early? Can you transfer your subscription to your new address if you move? - Most community solar programs will let you 'take it with you' at no additional fee if you move within the same utility area. Can you take the panels with you at the end of the term? - Although you do not technically 'own' the panels in the array, some programs will let you take your share of panels home after the project is decommissioned. It's better to consider this more of a friendly 'bonus' than a central benefit for signing up, however.